Question Proposed on LinkedIn: What are the biggest mistakes employers see on your social media sites like Facebook, LinkedIn, and Twitter? – Today, a company that I follow provided a handy tip with no other agenda. It was so refreshing – and it immediately endeared me to the company. Most other individuals / companies just seem to push their ‘stuff’ or their message. I think most genuinely don’t know how to provide value (or are scared to deviate from a ‘push’ approach), but no agenda, valuable content really ‘pulls’ attention to the author in a good way that ‘push’ tactics can never do – in fact, in all the noise, ‘pull’ and ‘push’ are polar opposites! – Content with spelling and grammar errors. Huge turn-off. – People who, post something, disagreeing with the flow of comments, just to get noticed. That’s not the way to do it! – When someone follows me on Twitter and I follow back. I immediately get a generic message asking me to: follow them on FB or purchase their product. Nope. – Firstly, those who have no contact info on their profile, especially when they say contact me or best way is to email or phone me – NO company info, no link, no nothing – and as difficult as it is for me to say this – those who don’t have it visible even after you’re connected. Secondly, those who have a large network who say they would rather just do email connections – heck if I wanted just an email connection I’ve got 43500+ email contacts in my gmail account with tons of folders people are saved under. Ask for OR give referrals/endorsements without doing even business along with (Unless apropos to digital discussion) an immediate phone call within minutes to DISCUSS our connection. Promises to call or email or respond back to something and it never happens, especially when they new a time limit was essential in responding. There’s more believe me, but on the good side people who are real and open. I’ve been an open networker for a few years now & have over 10,000 directs and I DO make notes on every memorable profile and tag them with the new feature – I also, save my outstanding people on file. The TOP of the heap GOES INTO my phone as well – they get saved on linkedin, my email, my desktop and my phone… and believe me, I want 3-5 people in every field that way. – Bait and Switch. When someone says they are contacting me for one reason (to get my attention) then the conversation immediately flips into a sales pitch from someone I don’t know, and now don’t trust based on their approach. The last one sent me a message (via LinkedIn) and implied that she had “some recent changes in a certain industry that I follow that she wanted to share with me.” We had some mutual friends, so I obliged and responded. She then gave me some sales pitch on her company. I asked her about what the changes were and I never got another response. I just don’t know how people see that as an effective long term strategy. – Plugging their website. I feel had when I click and go to their site promoting their book blog or whatever. -Referencing illegal drugs is the most damaging thing you can do to your job search. According to Jobvite’s 2013 Social Recruiting Survey, more than 80 percent of recruiters said seeing mentions of illegal drugs in a candidate’s social updates left a negative impression. Stay away from any mention of drugs, even if you’re joking, or run the risk of ruining your reputation. – Next in line for topics to avoid are tweets or posts of a sexual nature. While it may be funny to your friends, that joking status update or tweet is most likely offensive to others and damaging. You wouldn’t dare send that joke, photo or link in an email to your boss, so keep it out of your social networking stream. – People’s attitudes about gun ownership and usage vary widely. Where someone lives and whether he or she is rural or urban may also impact how they perceive guns. You should know that most hiring entities negatively view references to guns, so conceal those weapons. – Employers have little tolerance for the use of profanity online. According to Jobvite, 65 percent of recruiters viewed status updates containing profanity negatively, putting it in the top three things not to do. Profanity is unprofessional, offensive and wouldn’t be tolerated in most workplaces. As old fashioned as this may sound, keep your language clean. – When candidates who are actively seeking employment post pictures of them drunk and partying. 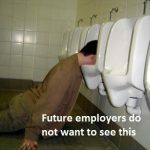 Employers will find you, so keep it clean!